AirPlay Mirroring lets you send what’s on your Mac screen to an HDTV wirelessly with Apple TV. Apple TV (2nd generation or later) with software update v5.0 or later. AirPlay turned on in the Settings menu of the Apple TV. AirPlay Mirroring requires either a Wi-Fi (802.11 a/g/n) connection or an Ethernet connection to the same local network that your Apple TV uses. If your Mac supports using your Apple TV as a display, an AirPlay menu appears in the menu bar when an Apple TV is on the same network. The AirPlay Mirroring menu icon turns blue when AirPlay Mirroring is on ( ). In Mavericks select AirPlay Display. In Mountain Lion select AirPlay mirroring. 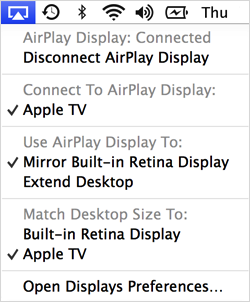 Note: If you don't see AirPlay Display or AirPlay Mirroring options in the Displays pane of System Preferences, then your Mac model does not support this feature. To turn off AirPlay, select "Turn Off AirPlay" in the AirPlay menu or from the Displays pane of System Preferences. You can also press the Menu button on the Apple TV remote to end the current AirPlay session. You can choose between two desktop resolution matching modes that let you select which display will have the best image. When AirPlay Mirroring is turned on, select an option under "Match Desktop Size To:" in the AirPlay Mirroring menu extra. AirPlay Mirroring changes the desktop resolution to best match your Apple TV, resulting in a 16:9 image that fills the HDTV screen. This setting often produces the sharpest image on the HDTV. The aspect ratio and/or resolution of the built-in Mac display may change to accommodate the Apple TV. AirPlay Mirroring scales the contents of the desktop to fit on the Apple TV, leaving the resolution of your Mac's display unchanged. Use this setting for the sharpest image on your Mac's display. Depending on your Mac model, the resulting image may not fill the HDTV screen. If your Mac and Apple TV are on the same network, but no AirPlay Mirroring menu appears, your Apple TV may be asleep. Simply press a button on your Apple TV remote to wake it up. After a few seconds, the AirPlay Mirroring menu extra appears. If you still don't see the options you expect, make sure your Apple TV has the current software update installed. Also make sure that you have the "Show mirroring options in the menu bar when available" option selected in the Displays pane of System Preferences. Some HDTVs have bezels that cover a small percentage of the screen. This can result in a slight cropping of a full-resolution HDTV image. Depending on the HDTV model, AirPlay Mirroring may automatically adjust the picture size to prevent cropping. If you are using OS X Mountain Lion or later, and you see cropping of the menu bar or Dock when using AirPlay Mirroring, toggle the Overscan correction option in Displays preferences. HDTVs often apply picture quality enhancements intended to improve the look of film and video sources. In some cases, these enhancements can lead to over-sharpening artifacts when displaying your Mac desktop. Some HDTV models have built-in settings to change or disable the enhancements for use with a computer (computer, presentation, or game modes). Otherwise, the controls for sharpness, detail enhancement and noise reduction can be used to optimize the appearance of the Mac desktop. Consult your HDTV’s manual for guidance on the appropriate settings for use with a computer. Click Security & Privacy, then click Firewall. Click the lock icon to unlock it if it's locked, then type an administrator name and password. Deselect (uncheck) the “Block all incoming connections” checkbox. Select (check) the “Automatically allow signed software to receive incoming connections” checkbox.